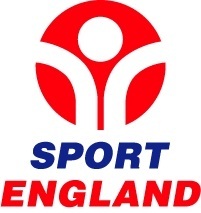 Last January, Sport England, the body which presides over the allocation of public money to sports development in England, announced its plans to invest £493m in grassroots sport over the next four years with the aim of keeping alive the legacy of the 2012 Olympic and Paralympic Games. In accordance with this aim, the funding allocations were redistributed in favour of those sports with a solid, workable plan or a good track record for increasing participation, while those sports which are under-performing in this respect saw their funding cut. For both codes of rugby, as well as cricket, there was an expected reduction in funding. The failure of all these sports to provide adequate evidence of actual or projected growth in numbers participating made this inevitable. Despite all three sports being commercially successful at the elite levels, clearly the attraction and retention of players further down the chain is more problematic and my own experience as an age grade coach in rugby bears this out. This tells me one thing – we need to get our act together and start delivering on the RFU’s objectives for player recruitment and retention, before we lose even more funding. This isn’t going to be easy, especially when the chief competition to both codes of rugby in their core market (little boys who like chasing a ball around and being part of a team) is football, a sport whose funding was increased by 582%. That’s five hundred and eighty-two percent, in case you think it’s a typo. It was a stat that threw me into a fury of outrage at the time. “How the hell” I thought, “can they justify that kind of increase in funding to a sport that is already swimming in cash? Why can’t grassroots football development be funded by donations from every Premier League player – God knows most of them wouldn’t miss £5000 a week.” And so on in a similar vein until the initial surge of anger had dissipated. But that’s irrelevant to rugby. So is the fact that football is the first point of call for most parents wanting a sporting activity for their boys; ditto the fact that in the majority of primary schools, football is the only formally organised sport available to boys. Football clearly has a massive advantage over rugby in terms of initial recruitment of players, but the fact remains that football’s performance in growing the game justifies its increase in funding, while rugby is being told to pull its socks up. As the guardians of the game’s future, we have to strive now to justify the same kind of largesse from Sport England in turn. Here at the start of a new season, it’s a time when we should be focusing our minds on this very issue. So just what can we do to encourage more youngsters to take up rugby first of all, and to ensure those we have stay with us? Focus on FUN and skills development rather than winning. A winning-is-everything mentality will, over time, drive more players away than it attracts. If you focus on the players learning and enjoying themselves, the results will follow. Treat every player as of equal importance. Whether they are the strongest player or the least talented in your squad. Don’t treat ‘star’ players as special cases. Fairness and consistency are key ways of showing respect to your players; conversely, nothing alienates parents quicker than their child being dealt with unfairly. If you’re lucky enough to have enough players for 2 or 3 teams, consider making these mixed-ability rather than A, B & C etc. Having a really strong team that wins games easily will not teach them anything; by contrast, players in a weak C team who get battered every week will soon lose the will to keep turning out – yet these players could be the stars of your Academy side if you keep them. You also avoid the dilemma about ‘dropping’ players who are out of form if all your teams are playing at the same standard. Foster team spirit. This should be done both on and off the field by getting the players to do social activities together as a whole squad a few times each season: bowling, laserquest, obstacle courses or a simple barbecue are all great ways to do this. Taking them away on tour or a camping trip provides a great bonding experience from which even the youngest players will benefit hugely. Get engaged. 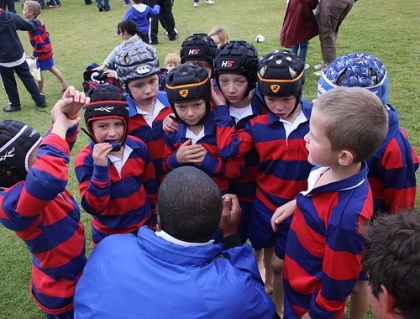 Engage with the players’ parents and enlist their support for non-rugby activities like first aid, fundraising, organising tours and festivals. Make sure everything you do satisfies the core values of the game: Teamwork, Respect, Enjoyment, Discipline and Sportsmanship. The good news is that the new rules of play now being used across England are tailor-made to assist coaches with player retention. Player involvement is promoted by having smaller teams; fewer and simpler rules mean fewer reasons for refs to blow the whistle so the game keeps flowing. Tag rugby games at U7 and U8 are literally non-stop action with loads of tries and all players fully involved. From U9 upwards, the complex rules and technical skills are brought in by stages so that the learning curve remains manageable and gives kids real opportunities to develop at a pace that suits them. 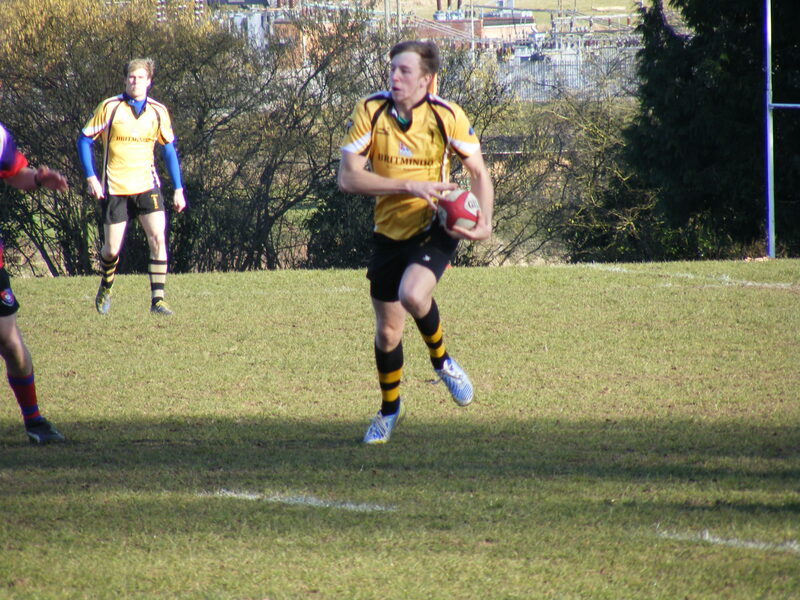 We have everything in place to make rugby an attractive option for youngsters and their parents. Smart, child-centred coaching will deliver the right outcomes. The only ones that should matter in age grade rugby are player recruitment, fun and enjoyment, skills progression and player recruitment. Let’s get it done. A year ago I wrote a piece about the development of young players at my club, who at that point had attained positions in the first team and went on to win the Norfolk Junior Cup final. This was a first for the club and to win away from home was a huge achievement. A year later, last Sunday, our club hosted the Cup final ourselves having again reached the finals. The opposition was the same club as last year, a team from a league higher than us who had finished mid-table. From our point of view, the squad has developed. Last year, we had a couple of Colts in the team. For example, the lad that ran the kicking tee was short of his 17th birthday by only a few days. This year, he has become a regular fixture in the starting 15. On Sunday, he took to the pitch as the fly-half. The other colts have equally nailed down their positions and we have welcomed some more youngsters into the first team ranks. The squad now has an average age of 21 and during the season lost only one away game, which led them to win the league and take the club into the highest league we have ever played in. Sunday came and at half time the match was 10-5 in favour of our guests. It finished 26-10 in our favour. A calm but focused approach and confidence in their play delivered the result. This gave us the league win and cup double – the first the club has ever achieved. To say this was a huge day for the club is probably selling it short! So, what’s this got to do with mini and youth rugby? Well, as the team ran out onto the pitch, they ran through a tunnel of our minis and youth players, which included brothers, sons and daughters of the players. Behind them stood their parents, friends and families. With the exception of a few RAF lads, every one of the boys in the first team has played in our mini and youth teams. There was a crowd of several hundred in attendance for a Junior county cup match. Every single mini and youth player was there. The approaches, game play and structures used in the senior squads are shared with the youth and mini teams. This has been put in place over the last couple of seasons as all of the coaches from the U7s upwards share ideas and work towards a common goal. The younger teams approach games in exactly the same way the seniors do. Match day warm ups and routines are replicated. A number of the seniors, who are young lads with no kids of their own, are turning out on a Sunday morning to coach the minis. One age group has 3 first team players as part of their coaching team. Talking to players after the match about the season, one of the 1st team said he knew there were good things going on when he watched the under 13s execute one of the moves he’d been running that week with the 1st XV. This is coming from a lad who had just won the league and cup double. The experience underlines the need to get the youngsters to understand that the opportunities are there in the senior teams at their club, that the seniors are part of their club and help develop them as players. They need to understand that by turning up to train they will be given the best training we can provide as a club and we will treat them seriously. As summer starts, the pre-season fitness sessions will be open to every player, mum, dad, etc. It takes a bit of logistical management, but as evidenced on Sunday, when the club comes together like that, it is very special indeed. Protein for Young Players: How Much is Enough? In the world of sports nutrition, protein is viewed as an essential component of the recovery process, however, there is much more to protein than just that. Protein is essential for children and adolescent’s growth and development – especially for their bones. Therefore, protein is really important for youth (and adults! ), so we must be aware of whether our children are getting enough. Children and adolescents need a specific amount of protein because they are growing fast. A simple way to know how much is to find out their weight in kg, and to have just under this value in grams of protein per day. For example, if a child weighs 55 kg then they would need just short of 55 g of protein per day. And of course, we cannot forget Turkey at this time of year. Two slices (although many probably go beyond this portion with their Christmas dinner) contains around 8 g of protein, and is relatively low in fat including saturated fat (unless you eat the skin!). It also is a source of many important vitamins and minerals – for example, it contains selenium which is an antioxidant and has a role in regulating our thyroid hormone which subsequently regulated our metabolism. It also contains B vitamins which help regulate our metabolism. Turkey doesn’t have to be eaten once a year – it is a great meat to incorporate into your diets due to its great nutritional profile. 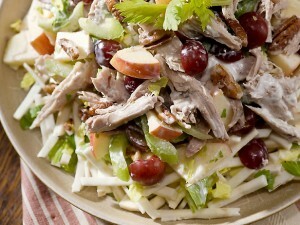 Why not try mixing some turkey breast meat, celery, apple slices, grapes and pecan nuts together with some salad leaves and sprinkle with a homemade dressing (e.g. oil, balsamic vinegar, mustard and honey mix would go nicely)! Yes and no. Protein shakes are a source of high quality protein, and everyone needs protein. Protein should be part of a child’s balanced diet for reasons already discussed and shakes are a novel way for them to get some. It is also a good way for vegetarians to get some protein in their diets. However, many companies tend to add all sorts of additives aimed at sports men and women, so make sure you read the labels and go for shakes with ingredients that you know. Care must also be taken to not replace other protein sources with shakes as these have additional nutrients that are crucial for health (e.g. red meat contains iron, fish contains omega 3 fats, etc.). Children should follow a balanced diet in order to benefit from a range of nutrients that different food sources provide. This is a good amount of protein – it is slightly more than the standard requirements so additional protein may be used to help recover from exercise. It is worth noting that vegetarians must ensure that they get a very varied diet because most plant proteins (except soy) are lacking in some of the essential components of protein. These are called essential amino acids. By having a range of different proteins, you will get a range of the different amino acids each one offers and should meet your requirements this way. The following link is a good source of information for the different types of protein that can be eaten by vegetarians and includes useful nutrition information that these proteins provide:http://www.thevegetarianathlete.com/nutrition.html. If you have any questions or comments, please do not hesitate to leave them below. I always look forward to hearing from you. Why Do We Bother With Laws in Mini Rugby? We’re a quarter of the way through season and already it’s been a very promising year for our U8s. Numbers are good, and at 29 players we have the biggest U8 squad our club’s ever had. This presents challenges in terms of getting all the players involved in games, but by being organised we’re able to ensure that, come match day, all of them get a fair amount of time on-pitch and everyone gets a chance to run with the ball. In training we try and maximise this with small-sided games on reduced pitches, and we split up all the ‘best’ players between the teams so that there’s a mix of ability in each – then we ensure that these more skilful players don’t hog all the play. It’s not perfect, but we’re at least giving all the players the opportunity to develop their skills in a fun and enjoyable environment. So far, so idyllic!! You would be forgiven for thinking that everything in our garden is rosy, but alas nothing is perfect and despite all of the above, I have a gripe. In fact, it’s a perennial gripe, one that I’ve noticed has become more of a problem at this level of rugby in the 6 years since I last coached an U8 team. And the gripe is this: we have a set of modified Laws for this form of the game, to provide a structured yet simplified framework for the kids to display their skills on; yet far too many coaches seem to regard a lot of these rules as inconvenient or optional. This creates points of tension and contention whenever we play a match against another club and – as my son has indicated to me – frustrates the hell out of my players when they feel the opposition has been allowed to cheat throughout the game. There are a number of possible responses to this. Response number 1. I relax my refereeing of the game and allow/encourage my players to infringe in the same way as other teams. This would allow them a level playing field to complete on, but it goes against the grain for me to tell my players it’s OK to cheat if it helps you win. I realise that as open-age players they’ll be expected to ‘play the ref’ and to be a bit smart and streetwise about infringing to slow down the opposition. However, I feel that when you’re taking players new to the game and moulding them into rugby players for the future, you should make every effort to reinforce respect for all facets of the game including the Laws – and for me that means serial infringers shouldn’t be allowed to prosper. Response number 2. I just chill out and ignore it – different refs interpret the Laws differently, my players have to learn to accept this, and as a coach I have to set the example for them to follow. Any frustration I feel needs to be hidden and I ought to focus on what my players can do to outflank the opposition even if the ref is letting them infringe. I would agree with all of that – except for the fact that my players deserve better, and when they know that the ref is getting it wrong, I’m the one they ask why. Somehow, ‘never mind the ref, look at your own performance’ seems a little too harsh a message to give to a 7-year-old. In any case, it’s not as if the Laws for U8 rugby are especially complicated or difficult to referee correctly, so surely it’s not too much to ask that a ref be more than just vaguely competent? Response number 3. I approach the ref in question, say at half-time, and request clarification on why infringements are or aren’t being dealt with. For example, to ask ‘I notice you’re not pinging them for handing-off sir, does that mean our players can do it too?’ However, this is fraught with difficulty. Some refs will take your oblique point and will clamp down on the relevant offence for the rest of the game, and will be happy that you’ve brought it to their attention. This is a definite win. However, other refs will take your intervention as a personal criticism and a rather tetchy exchange then ensues in which no-one emerges the winner. Response number 4. Never to allow anyone but me to ref our games – just not practical I’m afraid, and in some cases not necessary as a number of refs are every bit as good as me or nearly so! No, the only solution that is really acceptable is to get all coaches at our age group to referee using all the modified Laws, rather than ignoring certain ones to give their team an advantage. It’s the only way to ensure a level playing field for both teams in a match. ‘Local variations’ can mean that in some cases your team is asked to play a vastly different set of rules than they are used to. A few years ago, our TAG age groups toured the North East and on starting their first match at their festival on the Sunday, were surprised to find a ‘double-tag’ rule in operation whereby ripping off both an opponent’s tags at once, gave you an immediate turnover. All the Northumbrian teams were aware of the rule, but it took our players some time to adapt. Not all differences are as pronounced, but it is true to say that every time we play a match, the Laws used are slightly different from the previous game. For youngsters learning the game and the skills to play it, this kind of inconsistency needs to be stamped out. I meet coaches who justify a lax approach to refereeing mini rugby on the grounds that ‘They’re only kids’ (i.e. the poor little cherubs shouldn’t be burdened with being expected to follow the rules of the game). So why do you think the Laws are there? 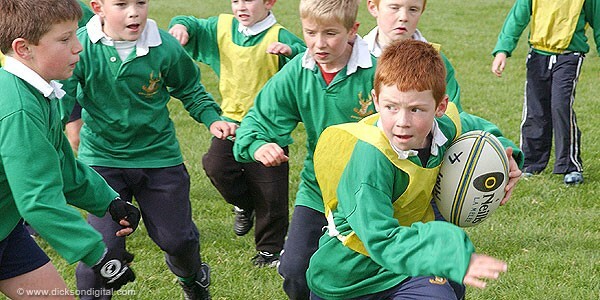 The fact is, the simplified Laws for TAG rugby are designed for kids to be able to follow. Yes, it might be difficult and onerous to get it across, but with time and persistence, it’s definitely achievable. And once the habit is formed, it gets easier to help the players adapt to the Laws as they change with the different stages along the Age Grade pathway. It might be that CBs and RDOs need to give some thought to mini rugby refereeing as part of a coach’s skill set so that we get more competent refs working with the youngest players, then match day will stop being a lottery based on what rules the home side thinks should apply. With the new Age Grade season now properly under way, I’m looking at the role of coaches in developing players. The turnaround in England’s fortunes in the 5 months between the end of the last World Cup and the conclusion of this year’s 6 Nations, as welcome as it was startling and unexpected, seems to have been due in no small part to the appointment of a new coach in Stuart Lancaster. This underlined for me the fact that even at the highest level, coaches make a massive difference in getting the best out of players – or in some cases, making a sow’s ear out of a silk purse. Although the team drew one and lost two Tests in South Africa, there were signs that this England regime is heading in the right direction especially in terms of team ethos and player accountability. 1. A great coach is in it for the development of his* players, both as rugby players and as people, as opposed to being in it for the benefit of his own ego. 2. A great coach never assumes he knows everything, or that he has nothing to learn from the players. 3. A great coach achieves maximum opportunity for player and skills development by finding a balance between coach-centred and player-centred learning that suits the squad as a whole. 4. At the same time, a great coach also recognises that the approach taken at Commandment 3 will not work for certain individuals, and so delivers appropriate development activity to suit these players as well. For example, a more supportive approach with players who are struggling to master a particular skill versus a greater measure of challenge to stretch players who have mastered the skill already. 5. A great coach listens as much as he talks, and asks more questions than he supplies answers – it’s preferable for the players to find solutions to their own issues than to have someone else’s ideas imposed on them. 6. A great coach does not tolerate prima donna players at whatever age, or allow ‘star’ players to dominate the team to the detriment of quieter, less pushy players. No one is more important than any other player or the team as a whole. 7. A great coach will listen to the concerns of players’ parents, but will not allow parents to dictate or interfere over on-field matters. 8. A great coach will ultimately aim to have his players grow to a level beyond which he can add any value to them – so that they outgrow him naturally as they develop. 9. A great coach will recognise when that moment has come and will hand them over to someone else – even if it is earlier than he had prepared for. 10. Finally, and coaches forget this at their peril, a great coach always remembers that players play rugby because they enjoy playing and so retains an element of fun and enjoyment in training throughout. Are you a great coach? We’d all like to think we are, but I know I don’t always live up to every one of my ‘Ten Commandments’. My teams won no trophies this year (the first time this has ever happened), but I’ve finished the season with 51 kids on the books most of whom turned out week in week out, who LOVE being there and who play attractive attacking rugby. Of those 51, 45 have returned this season. They have a great willingness to try out new things in matches, a double switch and a dummy bringing them a try last time out, and they play for each other as much as for themselves. Every one of them is a star to me and there’s not a single one I’d want to lose. We’ll see how they are as players at 19 and judge me then I guess! The bit I would like to discuss is the under 9 changes. The key changes are that there will be no scrum or line-out, and no rucks or mauls. The “tackle” is defined as any attempt at contact from the arm-pits down, and after bringing the ball carrier to ground, a tackler can no longer compete for the ball. There is also no ripping the ball out of contact. 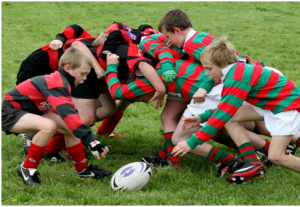 In my last blog, “U9 Mini Rugby Frustration” I wrote about the fact that (in my opinion) tackle-shields (and the timescale imposed/coaching techniques) encourage young players to run into contact. I mentioned that there needed to be a balance. Rugby is a contact sport and many players take up the game so they too can play the game they watch on television. Having coached under 7s and under 8s, I could see that many young players are keen to start playing ‘proper’ rugby. This phrase has driven a lot of discussion in forums about this pilot. Those in favour of the changes point out that contact is only a part of the game, but I have examples of players that stop playing at the end of the under 7 season because they do not want to play TAG for another season. In the worst case example, the player moved to another club that allowed him to play up a year. My view, and it remains only my view, is that the basic structure of the pilot is flawed. Data on the impact of the initial pilot which was set as a three-year plan cannot have been captured after year 1. Of course, there are many statistics which show more tries being scored and more passes being made at under 7 and under 8 levels. This is where games are 4-a-side, but statistics still do not show whether all players scored more tries and were passed to. It just shows more of the activity. The critical impact of this proposal cannot be measured yet – that is the retention of players. How do we know that those moving from under 8s to under 9s will come back to a game that differs from the sport they thought they were playing? One of the reasons for what is a watering down of the contact aspect of the game is that it was suggested that this puts some players off. What about those players who want that aspect of the game? Surely this is the beauty of our game. I read a blog from a coach I really respect recently, which said that this sort of approach is the same as taking your child to boxing because they wanted to play that sport, but not allowing them to punch anything. The trick is to coach technique in all aspects of the game: evasion, contact, ball retention and recovery, passing, catching, etc., and work with the children to raise their skill levels and individual confidence in all the areas of the game. If we make it just an evasion game, do we not run the risk of alienating those players who aren’t fast and elusive? Isn’t it a coaching skill-set which needs to be improved rather than delayed?